Why an IT automation solution? How does Ansible fit in Red Hat’s management strategy? Next-generation applications require next-generation computing environments, like scale-out IaaS and PaaS clouds. The deployment of these cloud environments (e.g. OpenStack) can be challenging due to their inherent complexity and the relative maturity of the underlying technology. IT automation tools can help to dramatically speed up cloud deployments while drastically reducing human errors associated with manual intervention. Next-generation applications are developed after new methodologies, like DevOps, and new patterns, like the microservices architecture. Supporting the continuous delivery predicated by the DevOps methodology requires a toolchain that empowers developers to release early and often. In turn, the application update frequency depends on how fast, simple and efficient the DevOps tools are in the toolchain. IT automation tools are a critical addition to any DevOps toolchain, as they can operate a large amount of changes to complex application architectures, and to a large number of application instances, in very short amount of time. The ultimate ambition of IT organizations worldwide is to offer their LOB a fully automated provisioning of entire application stacks, through virtual machines (VMs) or containers, or "service orchestration". It’s an ambition as old as the private cloud, and yet, the industry struggles to make it a reality. The problem is that orchestration and automation are two incredibly challenging processes, because of the myriad of moving parts to coordinate, and the lack of standardized interfaces to programmatically coordinate them. Red Hat CloudForms, our cloud management platform, is top in class at orchestrating the whole lifecycle of an enterprise application (from provisioning to retirement), according to configuration and compliance policies. However, a great orchestration engine still depends on last mile automation to compose each tier of the application. The more flexible and powerful the IT automation engine is, the more complex applications that can be provisioned. Our customers already use Red Hat solutions in conjunction with various IT automation tools. With this acquisition, we want to offer that type of integration through the world-class Red Hat support and certification that makes open source consumable for the enterprise (exactly the same way we do for OpenStack and every other product in our portfolio). Ansible is simple to use. 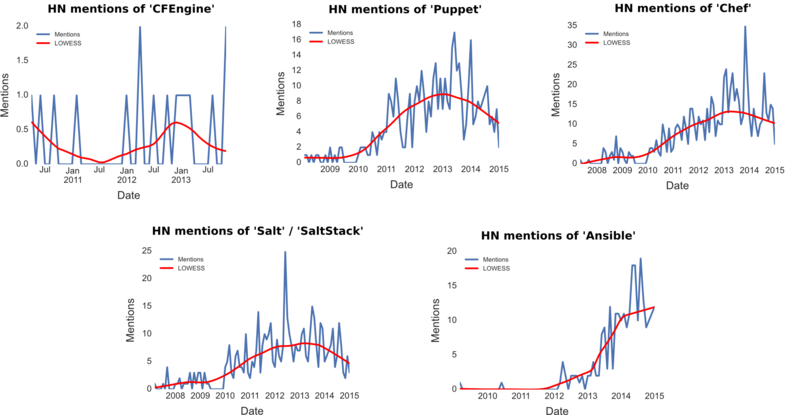 A quick Google search will reveal an overwhelmingly consistent sentiment about Ansible’s low learning curve and its simpler manageability. As we work to deliver the Frictionless IT that our customers need to address the demand of current and future generations, this focus on "simple" is critical. How simple? Let me give you two examples. First: Ansible’s "playbooks" are written in humanly-readable YAML code, which make easier to both write and maintain the automation workflows. Second: Ansible is agentless, using standard SSH connectivity to execute automation workflows, making it much easier to blend into an existing enterprise IT environment and its intricate operational framework. At the time of writing, Ansible ships 400+ modules, which can be invoked at will to extend the product’s capabilities beyond its core feature-set and intent. This is a critical capability that we want to offer in all Red Hat management products to support our customers as their needs evolve in terms of the maturity, complexity and scale of their IT. How modular? Let me give you one example. Ansible’s modular capabilities span from managing storage images in OpenStack Image Service (Glance) to managing Linux containers, to collecting data from a F5 Big-IP application delivery controller. Ansible is a very popular open source project. Ansible is an incredibly popular open source project and the community members contribute to both the core technology and the modules that come with the core. We believe that supporting and nurturing great open source communities is the only way to guarantee a continuous stream of innovation, and it’s what makes Red Hat so special. How popular? Let me share some telling examples. First, Ansible has more almost 13,000 stars and almost 4,000 forks on GitHub. Second, according to RedMonk, the number of mentions of Ansible in the Hacker News community is skyrocketing. Ansible is designed to support the deployment and configuration of a multi-tier application, through VMs and containers. This means that organizations can automatically provision different components of the same application on the tier that is most efficient to run them: scale-up workloads on bare metal and server virtualization engines, scale-out workloads on IaaS cloud engines and PaaS cloud engines. We do not believe in "one size fits all" approaches and we are committed to supporting the broadest range of infrastructure and platform engines possible. How far does Ansible’s multi-tier support go? Here’s an example. Ansible can manage VMs and guest OSes in a VMware vSphere server virtualization environment, deploy and manage instances in an OpenStack IaaS cloud, and deploy applications inside an OpenShift PaaS cloud, all at the same time. Ansible can be used to programmatically manipulate every layer of a computing architecture, from the infrastructure to the application, and for every use case, from orchestration to deployment to configuration. As I said at the beginning of this post, Red Hat is committed to enabling the provisioning of entire application stacks in the easiest possible way, and management consistency is a great way to keep things easy. How far does Ansible’s multi-layer support go? Here’s an example. Ansible can automate everything including the configuration of network, storage, compute (e.g. OpenStack instances), OS, middleware (e.g. Red Hat JBoss Middleware) and finally, application layers. Ansible can automate the configuration of a broad range of technologies from many vendors, not just Red Hat. Our enterprise customers have complex heterogeneous IT environments and the last thing we want is for customers to create redundant management silos, or embrace single vendor stacks if it’s not the best for their business. How far does Ansible’s multi-vendor support go? I have two final examples for you. First: Ansible supports both Linux and Windows environments, performing equally well configuring an Apache2 web server or a web application pool on Microsoft IIS. Second: through its modules, Ansible empowers IT organizations to manage a wide range of ISV and IHV technologies, from F5 Big-IP and Citrix NetScaler network controllers to Amazon Web Services and Google clouds. How does Ansible fit Red Hat’s management strategy? Red Hat CloudForms will continue to offer overall orchestration and policy enforcement across all architectural tiers we support, within the corporate boundaries and on public clouds. Ansible will automate the provisioning and configuration of infrastructure resources and applications within each architectural tier, as requested through the CloudForms self-service provisioning portal. This will include deploying Red Hat Satellite agents on bare metal machines when the use case requires it. Red Hat Satellite will continue to enable the provisioning and configuration of Red Hat systems (and security patches and software updates) within each architectural tier, as defined by the Ansible automation workflows. Red Hat customers will be able to adopt any of the three as standalone products, but we’ll work hard to tighten the integration between the three to enable them to work great together. We are very excited to have the Ansible team joining the Red Hat family and we can’t wait to put the product in the hands of our customers.